Much has been written about the relative impact of fixed and growth mindsets in the workplace. Among other things, people with a fixed mindset, who believe abilities and talents are fixed traits, are more likely to rely on stereotypes than those with a growth mindset, who believe abilities and talents can be developed. This has real impact for industries where fixed mindset is part of the culture of work. In a 2015 study published in Science, researchers found that the more particular fields emphasize raw talent as necessary for success (in other words, the more they have a fixed mindset), the fewer women earn PhDs in those fields. In another recent study, researchers showed participants the career websites of fake companies — these companies either conveyed a fixed mindset by saying on their website that they wanted to hire employees “who have the intelligence and abilities that we are looking for” or a growth mindset by instead focusing on how the company helps employees grow. When the company portrayed a fixed mindset, women trusted the company less. One reason for this is because they believed that management at the fixed mindset company would be more likely to stereotype them. With this in mind, we wanted to take a look at how fixed and growth mindset language changed the performance of job posts. If a job post reinforces fixed traits as essential for hiring — when the ad looks for the best and brightest, or top-tier talent — how does that change the performance of the post? 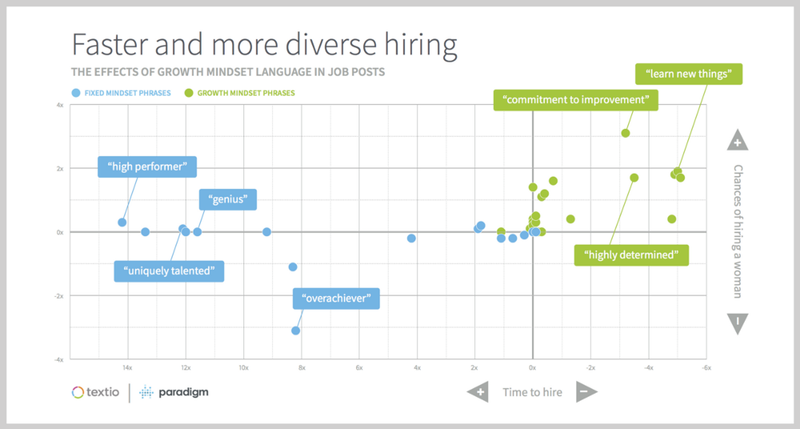 By contrast, when the ad describes hiring requirements more in terms of a growth mindset — using language like loves learning and seeks challenge — does that make a difference to which groups apply? To get started, Paradigm, a diversity strategy firm, identified dozens of phrases that are indicative of fixed and growth mindsets in the context of job listings. Then Textio, which makes software that companies use to optimize job posts to get more qualified and diverse applicants, measured the statistical performance of these phrases within their entire outcomes database. How do fixed and growth mindset terms perform in real job listings? Here’s what we found. Jobs where women are hired are twice as likely to contain growth mindset language. Given the prior research, the first question we investigated is whether the presence of fixed and growth mindset phrases statistically changes the gender demographics of hiring outcomes. Given the prior research, we expected that fewer women might apply to job posts heavy on fixed mindset language — which would result in fewer women being hired for these roles. We also expected that more women might apply to job posts emphasizing a growth mindset. Textio’s jobs database contains information about the gender of the person who eventually got hired for each job. We put the platform to work to find out whether our fixed and growth mindset phrases had any impact on the gender demographics of hiring. Of the 24 growth mindset phrases Textio measured, not one statistically predicted male hiring outcomes, and nine predicted disproportionately female hiring outcomes. On average, jobs where women are hired in the end are twice as likely to contain growth mindset language in the job post at the start. Among the highest impact phrases are striving, driven, highly motivated, and commitment to improvement. Job posts that emphasize fixed mindset language don’t show the same effect. All else being equal, jobs with fixed mindset language are just as likely to be filled by men or women at the end of the hiring process. But as we will see, fixed mindset phrases perform worse across the board — with men and women both. Jobs with a high density of fixed mindset language fill 11 times more slowly. One of the most important metrics that companies care about in hiring is time-to-fill. Does it take 4 weeks to hire a qualified person, or does it take 40? Time-to-fill is highly correlated to the quality and diversity of the initial applicant set. It makes sense: if you’re reaching a broad population, then you are much more likely to have many qualified candidates to consider — and you’ll hire someone that much faster. The presence of growth mindset language has a clear effect on time-to-fill (jobs containing a high density of growth mindset language fill 1.5x faster on average). There are some standout phrases that exert an even bigger effect. Phrases like learn new things, highly motivated, love learning, and strive exert a 5x impact — and curiously, these phrases are the same as those that draw more women to apply. The way you communicate in your job posts reflects your company culture. Your use of fixed and growth mindset can change your job performance, even including the specific people who will consider working at your company. But it’s worth reflecting that your language generally reflects your endemic cultural values, and most people prefer to work in environments where their growth is encouraged and expected.